This week’s bust of a major New York City gambling ring with alleged direct ties to one of the world’s most wanted Russian mobsters remains a hot discussion in the poker world. You can examine the basic facts of the indictment here, and fill yourself in on many of the indictment’s poker-world connections here, in FTrain’s excellent summary of those connections. 1) The Taiwanchik-Trincher Group. This is the brains and power of the organization as alleged by the Department of Justice. The indictment paints the operation as being under the control of Russian mobster Alimzhan Tokhtakhounov, also known as “Taiwanchik” and “Alik”. This operation was under the control of Vadim Trincher and Anatoly Golubchuk, with two other men, Slava “Stan” Greenberg and Michael Sall, also part of the brains and financing of the group. Besides the racketeering charges, Vadim Trincher himself was implicated himself in a separate extortion charge involving an unnamed “Client C-1”. The sportsbetting groups are a part of all three groups of indictments, not counting the poker, which is something of a curious add-on to the rest of the charges. 2) The Nahmad-Trincher Group. As defined in the indictment, this “Trincher” actually refers to Vadim’s son Ilya, who has backed many a poker player in recent years. This group’s interests per the indictment are almost entirely alleged to a sportsbetting operation which acted both in person and online. Interestingly, this is where most of the well-known poker players enter the picture, in most parts seemingly by taking and transmitting bets on behalf of other bettors, essentially serving as runners. The exceptions to this among the indictments known within the poker world are John Hanson and Abe Mosseri. Hanson is involved in several of the most serious charges facing this group, including another count of extortion, while Mosseri also is alleged to have a contributing role within the ring proper. 3. The Druzhinsky Group. Another sportsbettting cluster, but without obvious poker ties. 4. The Poker Game Group. Not defined as being part of any of the three groups specifically outlined in the indictment, this appears to have operated under the control of the Trincher family, meaning father Vadim and sons Ilya and Eugene. The “big game” in NYC was allegedly held in Vadim’s Trump Towers apartment, with Ilya, Arthur Azen, and people like Molly Bloom among the games organizers. Here’s what’s curious about the poker-game charges, which are Count #20 of the indictment. Titled “Illegal Poker Business,” the charge references Section 225 of the New York state penal code, rather than using a federal statute such as the IGBA, Wire Act or UIGEA. 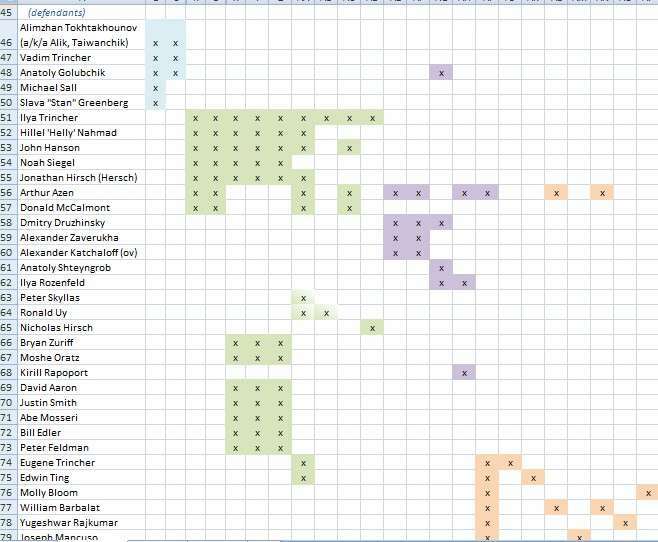 A complete, expanded chart showing all the charges against each of the 34 defendants, which best illustrates all of the relationships alleged in the indictment, can be viewed by clicking the following: trincher-bust-spreadsheet-of-charges. The poker-game charges are curious in several ways. That the game was being held in Vadim Trincher’s apartment and was organized by several of the figures in this case may not be the only reason the feds had for wanting to shut it down. Most of the supporting evidence in the indictments have yet to be made public, but one exception includes allegations surrounding the extortion of “Client-3”, who was forced under threat of violence to surrender a 50% ownership stake in his large plumbing company to the leaders of this group, to settle a $2 million gambling debt. The indictment doesn’t name Client-3, but does name his company Titan P & H (Plumbing and Heating) LLC, so it’s about the same thing. Discussion forums quickly filled up that this likely belonged to a high-stakes fish in the poker games called “Pete the Plumber”. A check of the Whois registration for the business’s online site even shows indictee Slava “Stan” Greenburg as the party of record. Whether or not Pete the Plumber is the same person known as Client-3 in the indictment or not, the filing does not indicate whether Client-3’s $2 million debt came from sportsbetting, poker or both. Nor have the multiple online sports sites connected to this operation been publicly identified to date. Nonetheless, if a poker-game debt was part of the extortion, much of which appears to have been recorded, then it would have given extra incentive to the feds to shut that game down. This group likely has connection to the Hollywood A-list game that was ruined by convicted fraudster Bradley Ruderman a couple of years ago. 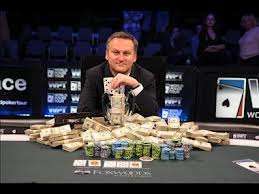 Ruderman was one of the fish in a big game populated by actors Ben Affleck, Leo DiCaprio, Gabe Kaplan, several poker pros, and others and Ruderman lost millions, which the other players discovered only later was playing on money swindled from Ruderman’s business investors. That led to numerous private settlements with Ruderman’s victims and the dissolution of the game. The common theme was that those West Coast games were also run at times by Molly Bloom, and a reporter who investigated that also wrote about the mysterious “Alik” (who we now know to be Taiwanchik), as the secret organizer of those games as well. Bloom, of course, was also among those indicted this week. Most of the defendants in the case have already been apprehended or have surrendered to authorities, with one minor exception being poker pro Bill Edler. Those already in custody will be arraigned tomorrow in New York City on the various charges.